This photograph was taken in the 1880s, and shows Poe Cottage on its original location, which was across Kingsbridge Road from the southern end of Poe Park. Although not much of the cottage shows through the summer foliage, the photo is an excellent illustration of what the rural Bronx was like before it became the urban entity that it is today. Edgar Allan Poe lived there from 1846 to 1849, when he left for a trip down South and died in Baltimore. At the time this picture was taken, the house was still a private residence. It was moved to its present site in Poe Park in 1913. I took this picture of Yankee Stadium on June 30, 1973. When the stadium was renovated in 1974 and 1975, the roof and its distinctive copper facade were torn down, and the upper grandstands were extended. For most of the stadium's history, the roof facade was exposed to the elements, allowing the copper to attain a green patina. In the late 1960s they started painting it white, which is how it appears here. The copper facade was more detailed and graceful than the reproduction that's now above the outfield bleachers. 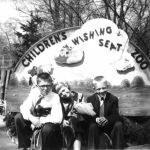 Located in the center of The Children's Zoo, which was one of the most popular attractions of The Bronx Zoo, was the Wishing Seat. The Wishing Seat was typical of the approach taken in those times (this picture was taken in 1958) by the Children's Zoo: most of it catered to children's innocence and playfulness. Today, the Children's Zoo focuses on teaching children rather than entertaining them. One of the many city housing projects built after World War II, Parskide is located between White Plains Road and Bronx Park in the north Bronx. This picture was taken in August of 1960 in front of 646 Adee Avenue. I believe the cross street in the background is Olinville Avenue. For those lucky enough to have known of its location, here was one of the only real waterfalls located in the Bronx. Although only five feet high, this fall, located on the Bronx River behind the Old Snuff Mill in Botanical Gardens, was truly wonderful to look at, and even better to play around. Many children who grew up within walking distance of the Botanical Gardens participated in the ritual of crossing barefoot over the top of the falls. Taken in September of 1958. This photo was taken in the early 1960's in front of the Rhino house of the Bronx Zoo. My grandmother lived near the Zoo and we could walk there from her home. I had a plastic key that I could insert in a box located by each "cage" that played a recording and described the living habits of the animals. My mother, Annette, and our dog Rusty standing on the corner of 184th Street and Morris Avenue in the 1960's. She is looking towards Walton Avenue. 184th street between Morris and Walton Avenue was the early home of the Bronx Museum. This is a photo of me wearing 'cool' wire rim shades from the early 60's standing with my dog Rusty on the corner of Morris Avenue and 184th Street. There was an old-style candy store located on this corner. This shop had a long formica soda-counter that was lined with stools (round red leather-cushioned seats on metal posts attached to the floor.) The camera points behind me along 184th Street in the direction of Creston Avenue and The Grand Concourse. The building across the street used to be the original Bronx High School of Science. It later became Bronx Community College. I'm looking towards Walton Avenue (located a block east of Jerome Avenue), home of my alma mata PS 33. This photo was taken in the late 70's, after a snow storm. The scene here is of White Plains Road looking south. The buildings visible on the left are on the corner of White Plains Road and Rosewood Street. On that near corner were located John's Bar and Grill and Micelli Photography Studio. The brick building on the right beyond the tow truck is the old Sanatation Department garage. I was standing under the White Plains Road Elevated subway at Bartholdi Street. Way off in the distance is Burke Avenue. The Grand Concourse at 165th Street in 1962.